Mortar: A product composed of cement and sand. When water is mixed in with this product, the cement is activated. Whereas concrete can stand alone, mortar is used to hold together bricks, stones or other components. How dense is wet concrete? Concrete and mortar both have a density of about 2 to 2.1 tons per cubic meter. This figure applies both to wet and cured material. There are special lightweight concretes as low as 1.4 t/cu m.
A mortar mixer essentially is a stationary horizontal trough inside of which is a motor-driven horizontal shaft with attached paddles that perform the mixing operation. The mixing paddles can be powered by an electric motor or gasoline engine. Some mortar mixers use a circular vertical drum. In these machines, the mixing shaft and its attached paddles are oriented vertically. As the concrete mixer’s drum rotates, the paddles lift and drop the ingredients over and over again to mix up slurry that will later harden into concrete. When the mixing is done, the drum tips down to pour out the wet mixture for use. A concrete mixer can also make mortar (but not as good as in a mortar mixer) but a mortar mixer cannot make concrete because the gravel in the mixture will jam the moving paddles. The Occupational Safety and Health Administration’s standard, Subpart Q, Concrete and Masonry Construction, Title 29 of the Code of Federal Regulations (CFR), Part 1926.700 through 706, sets forth requirements with which construction employers must comply to protect construction workers from accidents and injuries resulting from the premature removal of formwork, the failure to brace masonry walls, the failure to support precast panels, the inadvertent operation of equipment, and the failure to guard reinforcing steel. The standard, Subpart Q, prescribes performance-oriented requirements designed to help protect all construction workers from the hazards associated with concrete and masonry construction operations at construction, demolition, alteration or repair worksites. 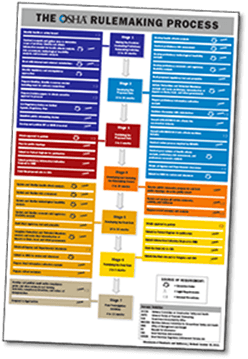 Other relevant provisions in both general industry and construction standards (29 CFR Parts 1910 and 1926) also apply to these operations. Protect Your Head: Wear a hard hat for head protection! Working on a construction site presents a variety of items to avoid that can cause serious head injury. Both construction equipment and tools are frequent potential hazards to concrete contractors and do-it-your-selfers. Protect Your Eyes: Wear proper eye protection when working with cement or concrete. Splattering concrete and blowing dust can easily enter your eyes during a concrete placement.Wear full cover goggles or safety glasses with side shields, depending on the conditions at your project. Protect Your Skin: Protect yourself from skin irritation and chemical burns when working with fresh concrete. Severe burns can result with on-going contact between fresh concrete and skin surfaces, eyes, and clothing. Get minor burns treated by a physician, if they persist. Seek immediate medical help if burns affect a large area of your skin or appear to be deep. Protect Your Skin: Avoid direct skin contact with sand and aggregate since they are very abrasive to your skin. Don’t handle wet cement directly since it is basic so it will be injurious to your skin. Protect Your Skin. Don’t handle cement without protection since it will draw moisture from your skin. 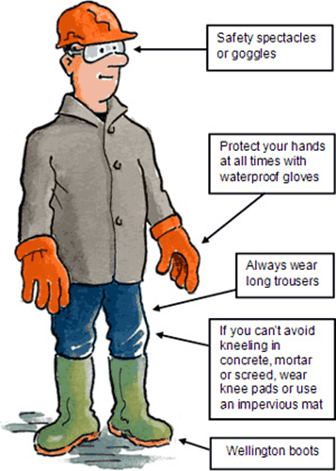 Wear protective clothing, such as waterproof gloves, long-sleeved shirts, and long pants to keep the concrete from making contact with your skin. Protect Your Skin: Ensure the protective clothing stays dry so it does not transfer the alkaline or hygroscopic effects to the skin. Wear rubber boots if you must stand in the fresh concrete while it is being placed, screened, or floated to prevent concrete from flowing into them and making contact with your lower legs, ankles and feet. Protect Your Skin: Use waterproof pads to protect your skin, knees, elbows, or hands from contact with fresh concrete during finishing. Flush eyes and skin that come in contact with fresh concrete immediately with clean water. Protect Your Skin: Rinse clothing saturated from contact with fresh concrete quickly with fresh water. Wear clean, dry, clothing each work day or for your project. Take a bath or shower at the end of the work day or the conclusion of your do-it-yourself project. Protect Your Back: Be careful how you move heavy materials. Working with the normal materials that are required to make and pour concrete such as cement, aggregate, sand, and water can be very strenuous to the average person’s back. Most of these materials are heavy even in small quantities. 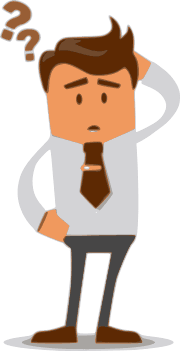 Protect Your Back: Take care to lift properly keeping your back straight and your legs bent to avoid serious back strain. Carry these materials, if you have to, keeping them waist high and centered between your legs to lessen the chance for injury. Protect Your Back: Use mechanical or manual equipment whenever possible to move materials as close to its final placement area. Use a cement mixer’s chute, a concrete pump, or just a wheelbarrow to get the concrete placed. Push the concrete to its final position with a shovel or similar tool. Do not lift the concrete mix. Before purchasing a mixer, the biggest consideration a mason contractor should weigh is whether they want to invest in performance, durability and options that are available with a quality mixer. One of the most important considerations is not only the durability of the components and parts of the mortar mixer, but also the availability of replacement parts. Replacement parts can be found easily for most mixers on the market, but to prevent too many work stoppages, look for quality components. This will help in determining the general cost of ownership. Another really imports aspects before buying a new mixer is the durability and efficacy of the paddles and drums. Short deep drums are more efficient than long, shallow drums because the paddles don’t have to move the material as far. Determine the drum capacity and power required. Ask for metal drums thick, and mixers unique features against competitors. Following the industry trends it is a factor to consider when buying new equipment, in the past years this trend includes the hydraulic mixers, which are more expensive than belt drive and/or gearbox drive mixers, and generally are employed by bigger contracting companies that need to mix larger loads. Additionally, these machines can operate in reverse to unplug mixes, less maintenance and less worn parts to replace. This motors are available for both mortar & concrete mixer. Electric motors are less expensive to buy and easy to use. 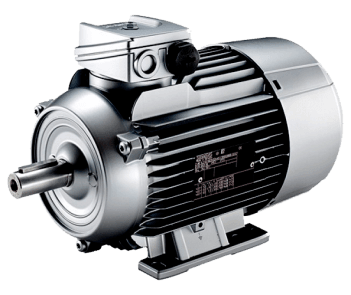 Electric motors are available with a dual voltage option, perfect for switching voltages. They are the best option for light mixers, general home use. Less noise than a gasoline/diesel engine. Electric motors are often cheaper to run than diesel or petrol types, although this can vary from manufacturer. Electric motors need a nearby mains power source or a generator. There is always a risk of electrocution in wet conditions, so they are not ideal for contractors who must work in all weathers. Electric motors are generally lower powered than the equivalents, so tend to have a much smaller capacity. Diesel models are extremely robust and very reliable. These mixers are much more economical than gas powered mixers. Diesel mixers have a huge capacity, so are perfect for large or outside town jobs and frequent use. 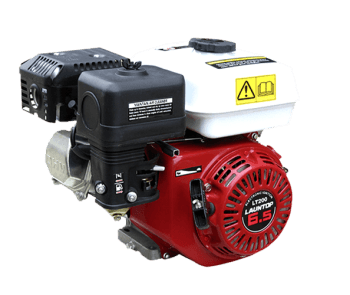 Diesel motor is powerful, and delivers a lot of torque, ensuring thorough mixing and aeration. Storing diesel is much safer than storing gasoline, and is much less likely to cause flash fires and explosions. Diesel engines are dangerous if misused, so some safety training is advisable. Diesel engines are noisier than gasoline or electric. The ‘side wheel’ used to tip the drum and empty the mixture requires physical strength to use. The fumes produced means that diesel mixers should never be used in unventilated areas. Diesel engines are notoriously poor starters in cold conditions, although some models incorporate an electric pre-warmer. 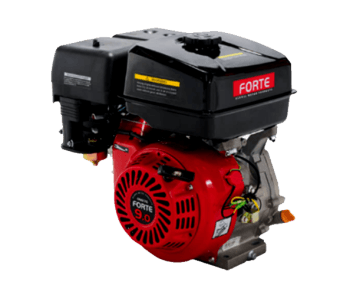 Gasoline engines are much lighter than diesel mixers, yet have enough power for most tasks. Gasoline engines are not as expensive as the diesel-powered mixers. Storing and filling the mixer with gasoline is extremely dangerous and users should be properly trained. Gasoline concrete mixers are the most high maintenance type and are prone to breakdowns and reliability issues. Gas mixers are usually the most expensive type to operate, which can be a big difference if the machine is used frequently. Gasoline motors produce dangerous carbon monoxide fumes, so these mixers must never be operated in enclosed areas. Have you ever thought about using spiral blades instead of paddles on your mixers?? Here are some benefits on using the spiral blade on the mixers. Less splash – reduces cleanup and increases capacity. No contact with the drum – reduces drum wear. No rubber blades – reduces maintenance. Improve mixing for color additives and dry mixes. Small rocks can be added into the mix. For hydraulic mixers you can you’re the options forward & reverse. We offer spiral blade kits for all our mortar mixers, and with our Spiral blade kits you can change from paddles to spiral without even removing the drum’s main shaft, ask your local dealer for more information.